What constitutes the ideal first visit to the Lyric Opera of Chicago in its gilded Art Deco house on Wacker Drive? For families with pre-adolescents, the answer is surely “Hänsel und Gretel,” the dryly funny, gently disturbing and elegantly performed story of two children, starved for love and desperate for food, who stick together to defeat a nightmarish witch in a takedown of gingerbread, courage and cleverness, all set to the stirring music of Engelbert Humperdinck. Innocence dies tragically too young for children of the modern day. Yet it was no less so in medieval Europe, when peasant folklore was ripe with cautionary tales of being swallowed by wolves, locked in towers, lost in forests, enslaved by evil stepmothers, poisoned by potions and paralyzed by magic — all giving voice to the darkest fears of childhood while providing for lessons in goodness, hope and heroism. 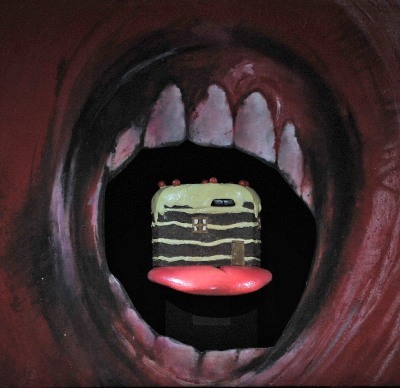 The Lyric’s production, a joint commission with the Welsh National Opera, conceived by Richard Jones and designed with wry touches of Magritte by John Macfarlane, is a darkly funny classic in its own right. The well-traveled show, now 14 years old, includes a star turn at New York City’s Metropolitan Opera, which was captured on DVD-HD. But as a whole, the current Lyric Opera presentation is preferable for the strong believability of the imperiled family and the great fun of being there, live in the opera house, when the witch gets her just deserts. The grotesqueries of Jones’ original concept have been softened ever so slightly in this Lyric revival, directed by Eric Einhorn and lit by Jennifer Tipton, the better to serve youthful sensibilities. Still, this is not a show for little ones, even though Humperdinck’s grand Wagnerian score, with a memorable dream sequence for the lost brother and sister who bed down for the night in a menacing forest, is a symphonic expanse of yearning and delight. Its intensity, like the purity of a child’s emotion, goes far beyond words. American maestro Ward Stare, in his Lyric Opera conducting debut, and the sumptuous sounding pit orchestra deliver a poignant account of it. 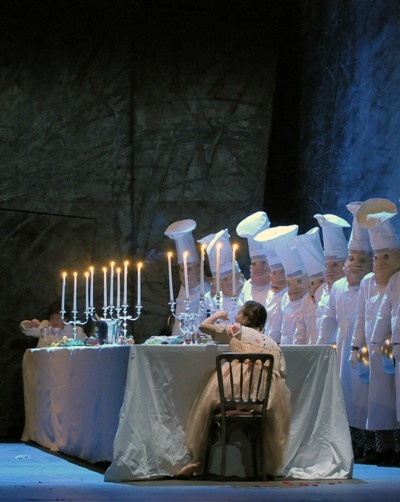 The hungry children’s dream sequence remains Jones’ singular achievement, filled with fanciful visions and quirky non- sequiturs, a veritable rapture of white linen, candelabras and food in overwhelming abundance served by chefs with oversize toques and angel wings. These whimsical servers should get a huge tip for their choreographed “reveal” involving giant silver chafing dishes, while the maître d’ — a giant fish in a tux — looks on. 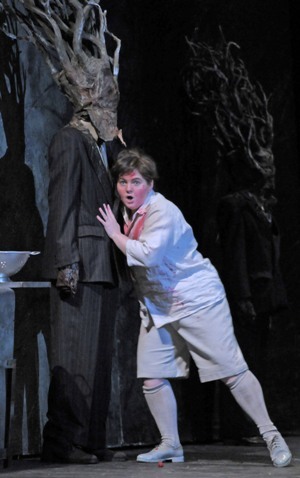 Lyric’s skilled cast is headlined by mezzo-soprano Elizabeth DeShong as Hänsel and soprano Maria Kanyova as Gretel — smart singers whose adulthood disappears behind a shrewdly managed repertoire of mannerisms that characterize adolescent gangliness, rebellion and high tolerance for icky substances. Among the other fine acting singers — in all, a very well-matched American ensemble — are soprano Julie Makerov as the broody, benumbed mother, too distracted to realize what she is doing when she expels her kids to the forest, and baritone Brian Mulligan, endearing as the rumbustious, and subsequently alarmed, father. Soprano Emily Birsan (dressed in black and maneuvering a wispy puppet) is the heavenly-sounding Sandman, and soprano Kiri Deonarine is all kitschy sweetness as the Dew Fairy, in heels and an apron a la Ozzie and Harriet. 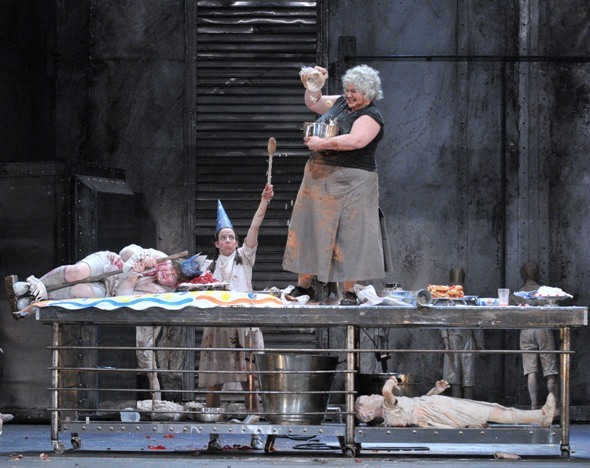 Anthony Freud, the Lyric’s new general director, was head of the Welsh National Opera when the company commissioned and first performed this version of “Hänsel und Gretel.” He’s obviously one who loves to tuck some fun up his sleeve. Freud’s next gambit is a night of comedy on Jan. 5 entitled “The Second City Guide to the Opera,” a collaboration featuring Renée Fleming and Patrick Stewart that promises to “put the fun in dysfunctional.” For a hint of what they’re up to, as it relates to Mimi and Rodolfo at least, click here. Meanwhile, the gingerbread wars of “Hänsel und Gretel” continue well into January.